Foodbuzz 24, 24, 24: A 30th Birthday Celebration – Norwegian Style! Among our friends, this has been a big year for birthdays. Many of us have turned 30 and we’ve made a real effort to get together and celebrate each person’s birthday. Shane is one of the last to hit this milestone and I definitely wanted to throw him a terrific party to mark the occasion. 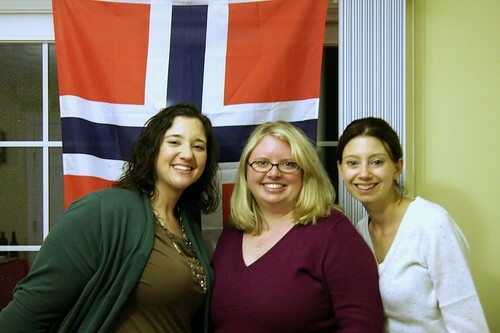 When my friend Lauren suggested a Norwegian-themed party, I knew it was the way to go. Shane is Norwegian and he’s very passionate about Norway and its food. 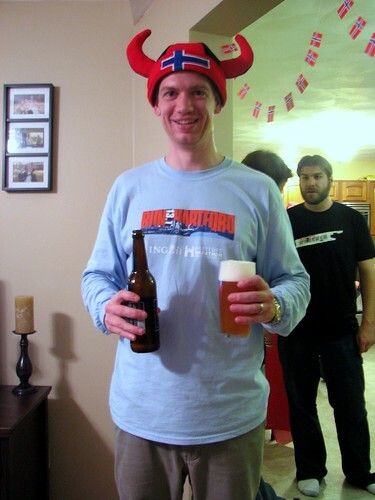 Since we couldn’t travel to Norway to celebrate his birthday, the next best thing was to bring Norway to our house! Before I met Shane, I didn’t know anything about Norwegian cuisine. Over the past 6 years, I’ve gained some familiarity and I thought it’d be fun to share with our friends and family! I was fortunate to be selected to participate in Foodbuzz’s 24, 24, 24 – a culinary event in which 24 food bloggers around the globe host unique meals during a 24-hour period. I always look forward to reading about this event each month so I’m especially excited to be participating this go-round. The menu came together fairly easily, as Shane has a few Norwegian favorites I knew we’d have to incorporate. I supplemented those favorites with just a couple of additional items I could obtain in local markets or make at home. Shane’s dad informed me about a great Scandinavian store close by my house so I took a trip there and made some really fun purchases which helped me to feel like the event was more authentic. Nønge Ø Pale Ale – Both the pale ale and saison are made by Nønge Ø, a Norwegian microbrewery started by two home brewers and Norway’s largest supplier of bottle conditioned ale. The pale ale was a refreshing light and hoppy ale. 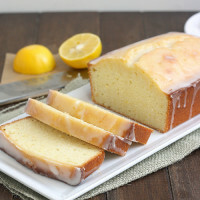 It disappeared quickly and I didn’t get to try any, but I heard from a number of guests that it was really good! Nønge Ø Saison – The saison was an especially refreshing beer, the type you’d really enjoy on a hot summer night. Shane rated it just slightly better than the pale ale. Mikkeller Beer Geek Breakfast – This beer was a hearty, oatmeal stout brewed with coffee, which explains its label as a “breakfast beer.” It had a wonderfully strong aroma upon pouring and the coffee taste was prominent but not overwhelming. Linie Aquavit – Though aquavit is available throughout Scandinavia, the Norwegians make a special variety called “linie aquavit.” Linie is the Norwegian word for “line,” referring here to the equator, as linie aquavit is shipped from Norway, across the equator, down to Australia, and back again in sherry casks. Many say the liquor gains a richer flavor as it sloshes around in the barrels over the course of the trip. The aquavit was described as potent and fiery and Shane commented that it reminded him of Norwegian moonshine. Vikingfjord Vodka – Vikingfjord is a variety of vodka distilled using only water from the Jostedal glacier in Arctic Norway. It is a bit stronger than typical vodka and has a clean, smooth taste. 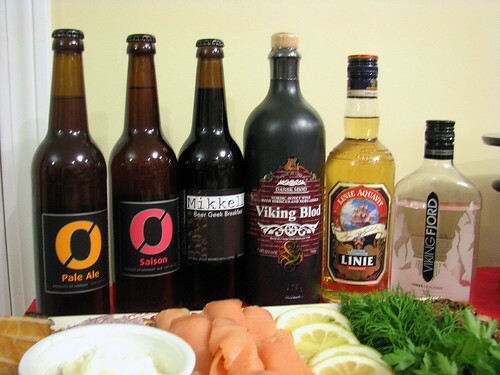 Viking Blod – Viking Blod is the oldest fermented beverage made from honey and is based on a recipe from the year 1700. Honey is the major ingredient in the recipe so not surprisingly, this beverage was described as sweet, fruity and floral by guests. It was probably the most popular of the six described here. The Viking Blod is technically not Norwegian but rather a Danish mead but it caught Shane’s eye in the liquor store so we decided to include it. Shane’s parents host a Christmas eve get-together every year and I remember the first year I attended and was introduced to smoked and pickled fish. I wasn’t interested then and suffice it to say, I’m still not a fan many years later 🙂 Shane, however, loves smoked fish and he doesn’t have it very often, so it’s a real treat for him. The platter I made included (from left to right) smoked trout, smoked salmon and smoked & peppered mackerel. I also put out capers, red onion, lemon, dill, parsley, lemon, sour cream and a mustard sauce (see below for recipe) as accompaniments. The smoked salmon was definitely the biggest hit among the guests – there was very little left at the end of the night. Not as many people were adventurous enough to try the mackerel or trout, but Shane gave a big thumbs-up to both! 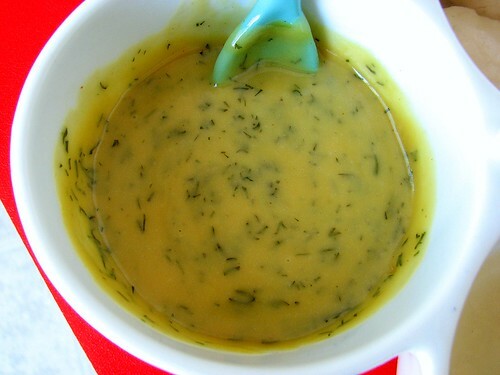 Though I didn’t eat any of the smoked fish, I tried this mustard sauce when I made it and even though I’m not a huge fan of mustard, I really enjoyed the sauce. I’m hoping to find other uses for it besides an accompaniment to smoked fish, so I can make it again! Combine the mustards, sugar, and vinegar in a small bowl. Slowly whisk in the oil and stir in the chopped dill. I was excited to discover three Norwegian cheeses to serve on our cheese platter. The first was Jarlsberg (top left cheese in the photo above). Jarlsberg, which is readily available in most markets, is one of Norway’s biggest exports. It is similar in texture and consistency to a Swiss Emmental but with a sweeter, more nutty flavor. The second cheese offered was Gjetost (top right in the above photo). Gjetost, is a unique brown cheese from Norway with a fudge-like texture and a sweet caramel flavor. It is made from a combination of milk, cream and whey which is slowly cooked until the naturally occurring sugars are caramelized, giving the cheese its distinctive color and sweet taste. I was curious about how many people would be open to brown cheese. It turns out the answer was quite a few! I was completely surprised by the crowd of people I saw slicing and eating the Gjetost. Not only did they try it, but I think everyone I talked to enjoyed it. 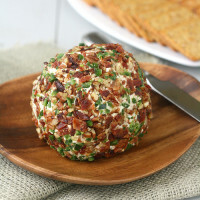 The final cheese offered was Gulost (the bottom cheese in the above photo). The Gulost was another pick-up for me at the Scandinavian store. I was told that it was a Norwegian-style Gouda, a mild cheese that would probably be a good option for kids and folks who weren’t adventurous enough to try the Gjetost. That opinion was pretty much spot-on and echoed by the guests who tried it. 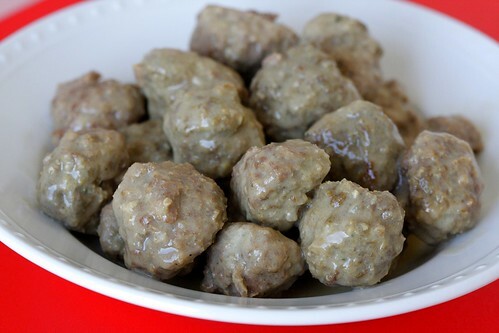 Shane adores his mother’s Norwegian meatballs and I was tempted to ask for her recipe, but I ultimately decided to be adventurous and try finding a new recipe to test. 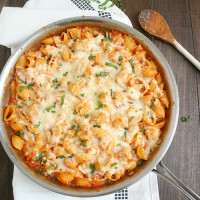 I was a bit concerned about this recipe living up to Shane’s expectations but I knew as long as I didn’t try to sneak any veggies in them, he’d probably be perfectly happy! I love that these meatballs are baked and not cooked on the stove-top. The process of making them went fairly quickly, though I will warn that this recipe makes a lot of meatballs (I think I got around 75) and shaping them can be time consuming. I found it was easiest to use my smallest cookie scoop to speed the process along. The meatballs were very well received by everyone and Shane thought they rivaled his mom’s. The gravy, however, was not nearly as successful. It was a bit bland so though I’ll almost certainly make the meatballs again I will go in search of a different gravy recipe. In a mixing bowl, combine eggs, milk, bread crumbs, onion and seasonings. Let stand until crumbs absorb milk (I let it stand for about 10 minutes). Add beef and pork; stir until well blended but be careful not to overmix. Shape into 1-in. meatballs. Place meatballs on greased jelly-roll pans. Bake at 400 F until browned, about 18 minutes. Set aside. To make the gravy, melt butter over medium-high heat in a large skillet. Saute onion until tender. Stir in flour and brown lightly. Slowly add beef broth; cook and stir until smooth and thickened. Blend in cream, cayenne pepper and white pepper. Gently stir in meatballs; heat through but do not boil. 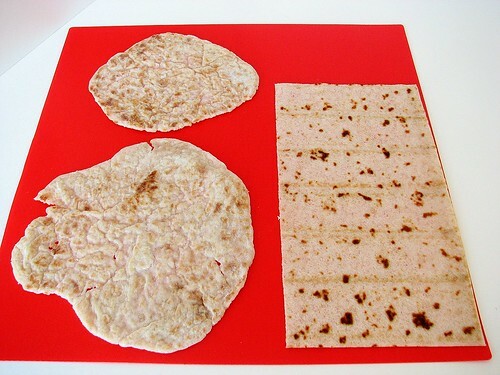 Lefse is a traditional potato-based Norwegian flatbread. I added it to the menu for a few reasons. We were planning to make knockwurst, as an homage to Norwegian pølse (hot dogs) (which, unfortunately I did not get a shot of), and I figured the lefse could be used as a roll for the pølse. Also, I wanted to challenge myself by seeing if I could make them from scratch. I did pick some up pre-made so I could compare my results with store-bought and, in a worst case scenario, have some to offer if I couldn’t successfully make them. Lefse can be used in many ways and one of the best ones I read about was spread with melted butter then sprinkled with cinnamon-sugar and rolled up – yum! The lefse proved incredibly challenging for me to make. There was a ton of moisture in my potatoes and I found that I needed to add a great deal of flour to prevent the dough from sticking to everything in sight. I did get a few made and I compared them to the store-bought (you can see mine on the left in the photo below and the store-bought on the right). When it came to texture, mine weren’t as tender or thin as the pre-made lefse. I’m sure I overworked the dough so I wasn’t surprised mine weren’t as tender. The flavor was quite similar between the two, though I did prefer the store-bought. 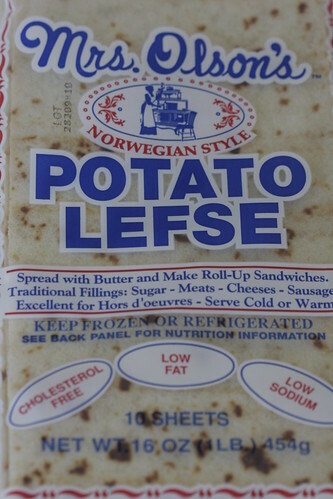 As you might expect, the lefse taste a lot like potatoes. A friend commented that they reminded her of potato pancakes and I thought that description was fairly accurate, at least for my slightly thicker variation. The pre-made were similar to wraps you might buy at the market for sandwiches. 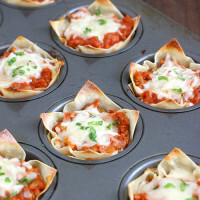 I’m glad I took a stab at making them but given the challenges, I’ll likely stick with store-bought in the future. In a medium saucepan, cover potatoes with water and cook until tender. Run hot potatoes through a potato ricer. Place 9 cups of the riced potatoes in a large bowl. Beat butter, cream, salt and sugar into the hot riced potatoes. Let cool to room temperature. Cook on a hot (400 F) griddle until bubbles form and each side has browned. 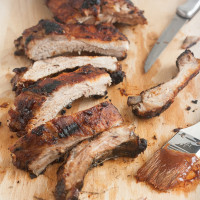 Place on a damp towel to cool slightly and then cover with damp towel until ready to serve. I debated Shane’s cake for quite some time. 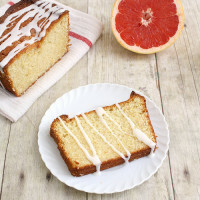 I kept changing my mind – first I thought I’d do a layer cake or a sheet cake but I kept coming back to the cupcake option. Since we’d invited quite a few people, I eventually decided cupcakes would be the way to go since they’re easy to grab and eat without a lot of fuss or mess. Initially I’d considered decorating each and every cupcake with the Norwegian colors of red, white and blue, but in the interest of keeping my sanity, that idea was tossed. 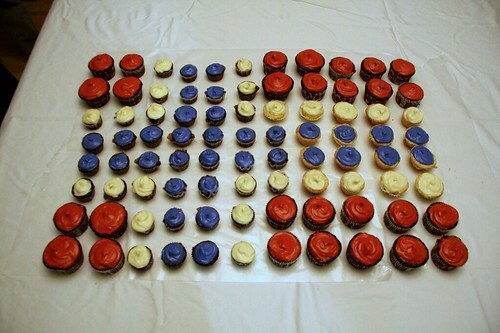 Instead, Shane and I worked together to create the Norwegian flag out of cupcakes. 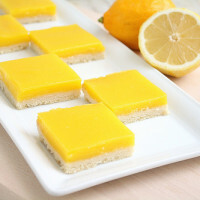 He arranged them, I frosted and I thought the result was a lot of fun! The only problem was people avoided eating the cupcakes because no one wanted to ruin the pattern! I made the cupcakes with one of my favorite go-to chocolate cake recipes – Hershey’s Perfectly Chocolate Chocolate Cake. 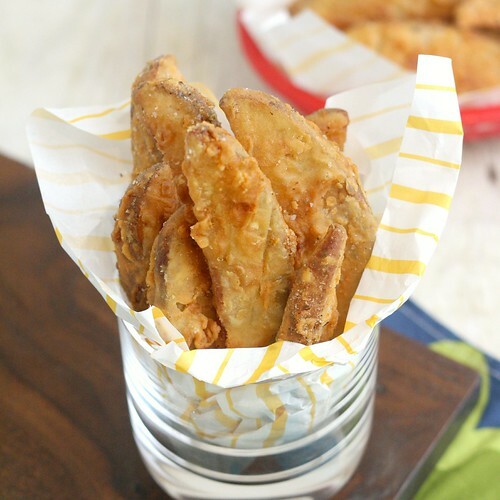 I previously blogged about this recipe here, and it is also available on the Hershey’s website. For the frosting, I used my favorite cream cheese recipe from Martha Stewart’s Cupcakes book. I’ve probably made it 3 or 4 times in just the past few weeks alone. I love how easily it comes together and its lightness. 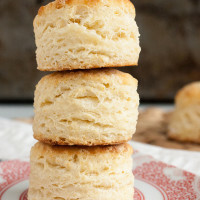 In the bowl of an electric mixer fitted with the whisk attachment, cream butter and sugar until light and fluffy – 2 to 3 minutes. 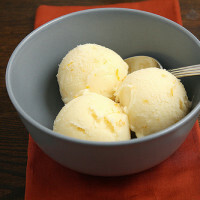 Add sugar 1 cup at a time, and then vanilla, beating until smooth and combined. 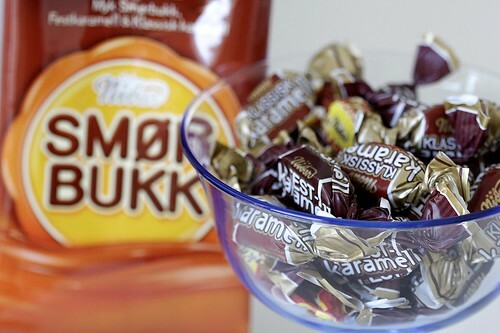 Smør Bukk are Norwegian caramels. I picked them up on my trip the Scandinavian store as a fun item to throw in a candy dish. A couple of friends tried them and commented to me about them. There were two varieties in the bag and apparently one type was more well received than the other but both were deemed tasty! Everything on the packaging was in Norwegian (though my knowledge of Norwegian cuisine has grown, my grasp of the language is lagging) so I’m not sure what was different about the two varieties. We also served pizza, which unfortunately, I did not remember to photograph. I wanted to make sure there was at least one menu option that people would surely recognize and welcome. I used this dough recipe for the pizza, which is one of my all-time favorites. 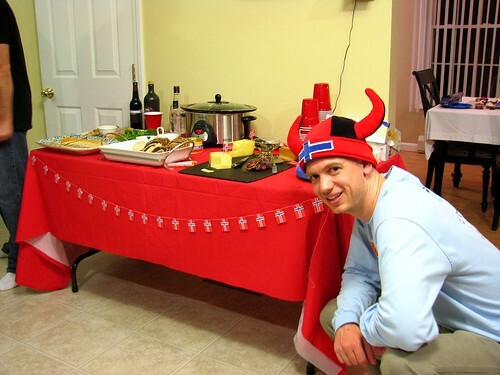 26 Responses to "Foodbuzz 24, 24, 24: A 30th Birthday Celebration – Norwegian Style!" This is so fun. You’ve made turning 30 look like too much fun for words. Plus, the dishes look excellent. What a fun post, Tracey – I practically feel like I was at Shane’s party! I just love the Norweigan party theme and menu – so creative. Everything looks incredible (okay, the fish balls, not do much, but everything else!) You did a fabulous job with this party – perfect way to celebrate such a big birthday! Shane married the wrong girl…I would have eaten everything at this party except the chocolate! LOL. 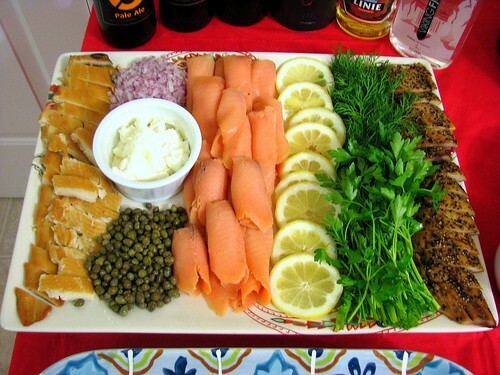 Your fish platter looks so good…all that lovely smoked fish…OMW that looks great! I love Norwegian food…I grew up in Northeast Iowa and there is a lot of Norwegian cuisine in that area…so good and such fun to see your party devoted to it. What a great job of throwing such a special party…no wonder you were so busy, I had no idea it was for ALL OF THIS! I can see Cathy’s mind going like crazy now thinking how she can throw a party like this…the girl is in the wrong line of business for sure…LOL. It’s probably a good thing you two don’t live very close to one another. Great job! Wow- what a feast! How sweet of you to make all that Norwegian food for him. My husband and his dad loved smoked fish too, but I find I can’t get past the smell. Your party turned out perfect. I love the Norwegian theme and the cupcakes. I want to try the beers. They sound yummy. I, unfortunately, did not get good photos of my party. I only took some with my blackberry. Looks like quite a spread…Glad you guys had fun! Sounds like it went fantastically! How did Shane’s parents like it? I love that picture of Lauren withe the fish balls. And I bet that mustard sauce would go great with roasted potatoes!! Hello! I, too, am a participant for this month’s 24, 24, 24. 🙂 Happy 30th Birthday to your husband! You did a very good job in bringing Norway to your very own home. Oooh, and the Hershey’s Perfectly Chocolate Chocolate Cake is my go-to chocolate cake recipe, too! 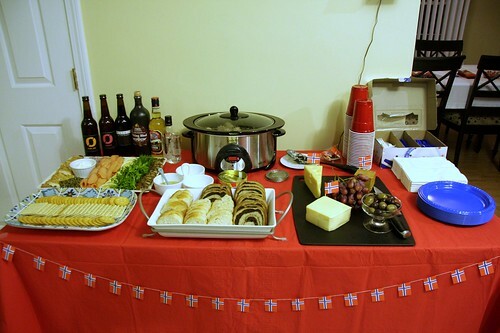 Tracey,you did a fantastic job with your norwegian themed party for Shane. The food was delicious and authentic! I just got an email from my sister Bethany (who lives in Norway for those of you who don’t know it) and she said “Tracey did a very good job!” So there you have it! Everything was wonderful! Way to bring in 30 with style, what a fabulous party! 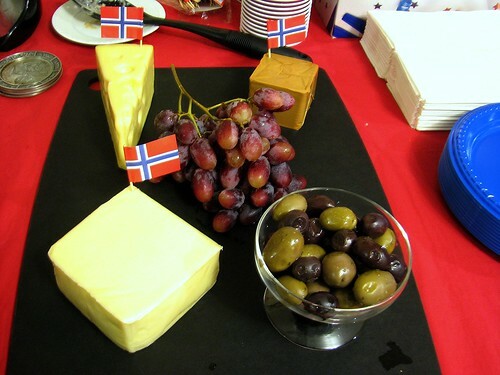 How fun for your guests to try all the Norwegian specialties. Hershey’s Perfectly Chocolate Cake is a great birthday cake, always a hit. I know that Shane felt honored by such a fun, creative, and delcious birthday menu! Great job, Tracey. I’m impressed with all that you planned and prepared. My girls gave me a Scandanavian cheese assortment for Mother’s Day, including gjetost. It’s interesting and different – great on dark bread. This was the best party ever! Thanks for doing so much to make it super fun!!! Wow what a good friend your are! !Now I want to go to Norway! 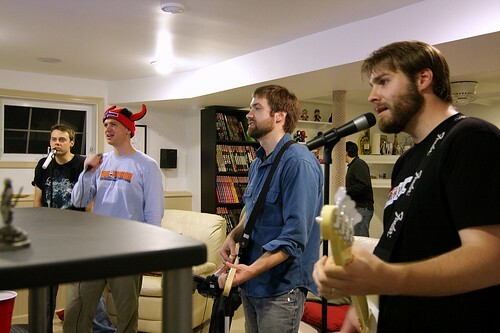 Looks like a fun time… I hope it’s that much fun when I turn 30. I celebrated my 27th birthday in style with the 24, 24, 24 this month, so I’ll have to think of a way to top it when I finally get to 30 (it’s closer than I want to admit!). It looks like a huge success! Happy Belated Birthday to Shane. And congrats to you on a job supremely well done! what a great idea for a party. love it! what fun. very creative. you’ve inspired me to want to do something like that too! Wow, what a spread! Looks like it was a huge success! Everything looks wonderful, and you can tell how much thought and attention you put into every detail. Well done! And congrats on the 24-24-24, that is just great! What a great way to celebrate the big 3-0! 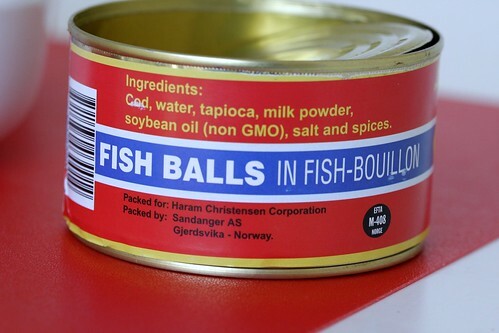 My mother in law’s husband is married to a Norwegian and she says the Fish balls taste really good with curry sauce. 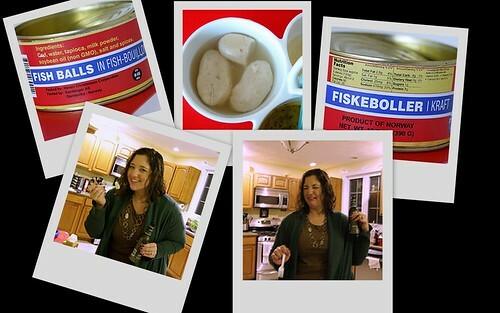 Fish balls – although my mother almost never used canned food, those fish balls were what I had as a kid in the ’50’s – with cream sauce, cubed boiled potatoes and peas. What my Norwegian friends and family served up was well-cooked, rich (think butter and real cream) bland and, for the most part, delicious. I have never put a fork into lutefisk but still have to keep a chunk of gjetost in the fridge… and a good Norwegian cheese knife in the drawer.